We then traveled a little further to Seltun, a large geothermal field seated at the base of a ridge. This area was drilled to supply energy to nearby Hafnarfjordur, but a silica build up in the borehole caused the area to explode in 1999. 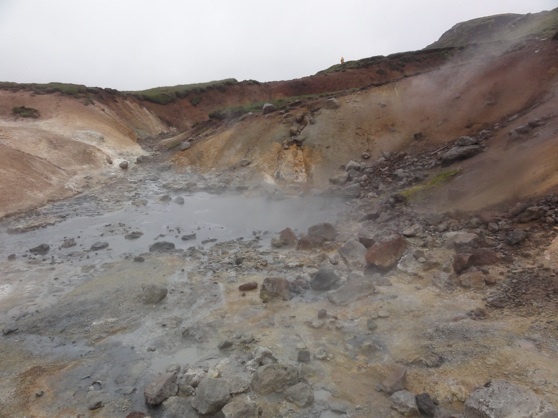 Another interesting thing to note about this area is the legendary Hverafugl, or “hot spring bird” that supposedly hops into a geothermal vent to hide from humans when they approach. People don’t really believe they exist anymore as a picture has never been taken of one, but older generations believe the birds are apparitions in the steam that represent spirits of the dead. We did not see any Hverafugls, they were clearly hiding. I decided to stick my hand in to see if it was hot- it was. 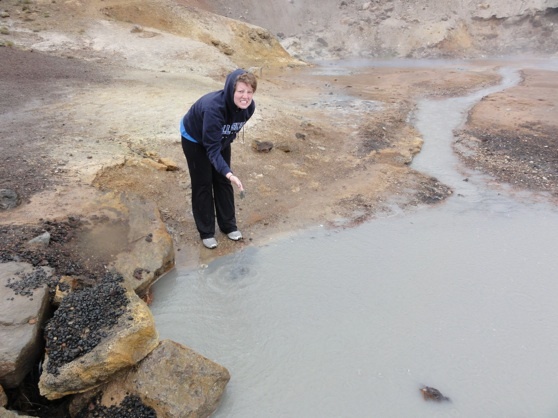 Can you imagine what the vikings must have thought when they first saw water boiling up out of the ground? 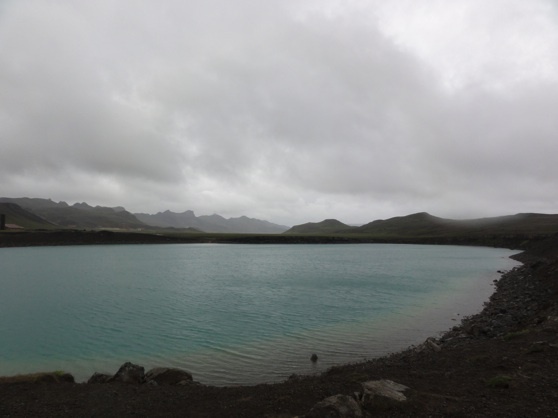 We then continued a little further to Graenavatn, a strange green lake that is supposedly an old explosion crater. The green color is due to the minerals from the nearby geothermal field as well as algae. At this point we turned around and came back as we had seen a lot of the peninsula yesterday, and seeing as we haven’t shared the sights on the blog yet, we thought our Estonian colleagues would appreciate seeming some coastline with real cliffs- no offense Nick, your study site is really cute! We started in Hafnarfjordur and ended in Rekjavik (bad map) but saw some incredible things along the way! 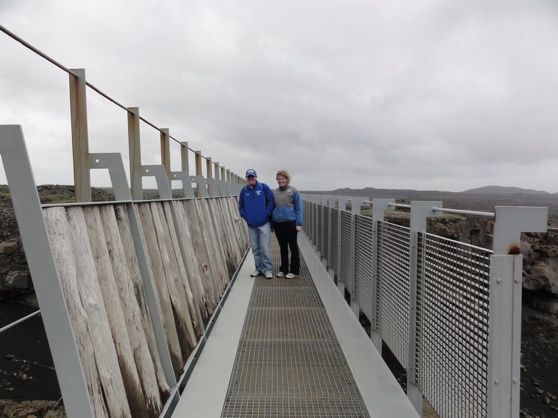 The first stop was at Leif the Lucky’s bridge, a spot where you can travel across the bridge from the North American to the Eurasian plate. It was so cold, rainy and windy! 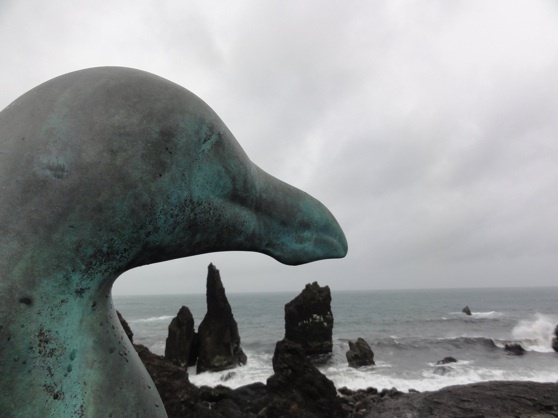 Stop number 2 was Valahnukur, a coastal area with dramatic black cliffs and powerful waves. 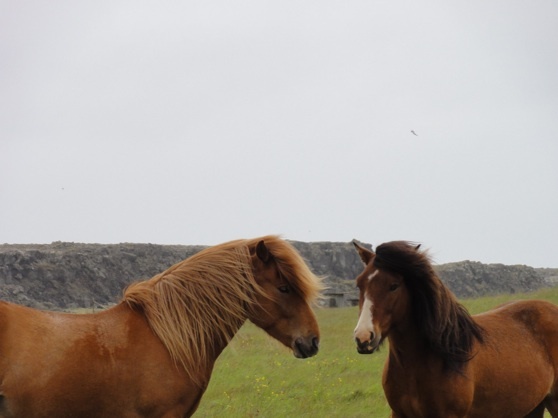 We added Icleandic horses to our wildlife list as some were in a field right off the road to the ocean. The cliffs hosted a large population of seabirds, the most famous of which was the Great Auk, a now extinct breed of flightless bird. The last Great Auk was apparently shot, killed and eaten on a small island 10 km off the coast. 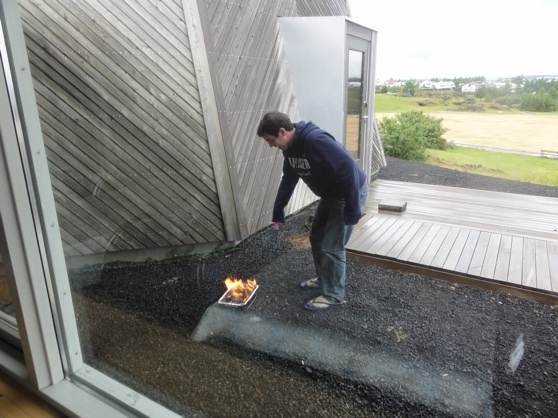 Some countries try breeding programs, Iceland has a BBQ. 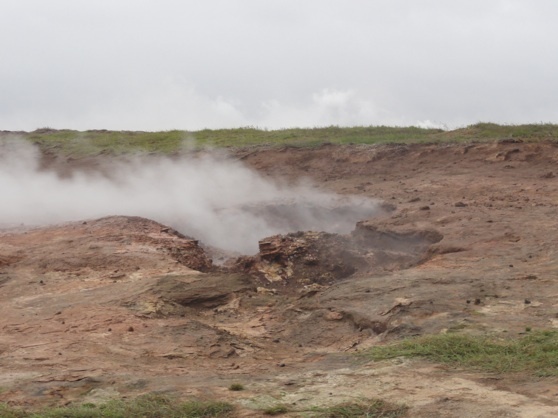 Our last stop of mention yesterday was in Gunnuhver, a geothermal area named after Gunna-a legendary witch/vengeful woman depending on the guide book you read. The story that I like best is that Gunna didn’t like her neighbor, so killed him and his wife. The other villagers instructed her to hold on to a knotted rope, she complied and they then dragged her into the geothermal springs where she perished. We all thought that this story was missing some explanations and was probably literally translated from Icelandic. After a long afternoon of sightseeing, we headed back home to cook dinner at our cozy guesthouse. Happy Fourth of July to our Estonian colleagues in return! Today we found BBQ sauce and corn-on-the-cob at the grocery store and had a lovely celebratory dinner! Perhaps if we had been able to combine the Estonian weather with our Icelandic dinner we would have had a pretty good approximation of an American Fourth of July! Off to Travis’s study site in Blonduous tomorrow. 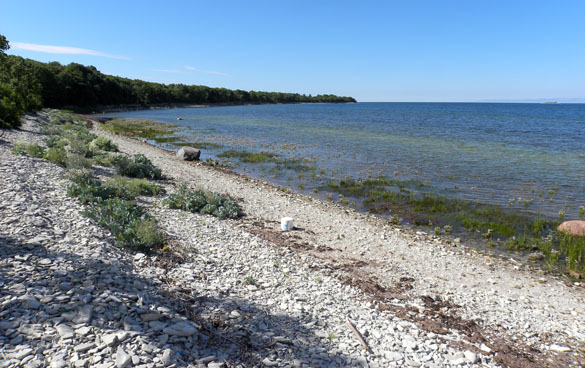 KURESSAARE, SAAREMAA, ESTONIA–The Wooster Geologists Estonia Team today braved the Baltic Sea again and took a ferry from the island of Hiiumaa to return to their previous field sites on the island of Saaremaa. We worked at Soeginina Cliff on the western coast (shown above) to finish up Nick Fedorchuk’s Independent Study field research on the Wenlock-Ludlow (Silurian) erosional sequence. It was a fun day because we now have hypotheses to test about these rocks and fossils. More on those later. The above rock shows an advantage we have studying exposures on rocky coastlines. The waves erode blocks of limestone from the cliff and polish them up on the boulder-strewn beach. 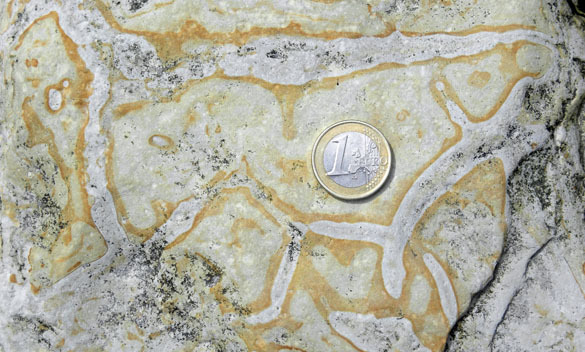 We can thus see our rocks in three dimensions rather than just the flat cross-section we would normally have. The trick, though, is to know from where in the section the boulders were derived! We found some excellent sections through the numerous oncoids in our outcrops as well. 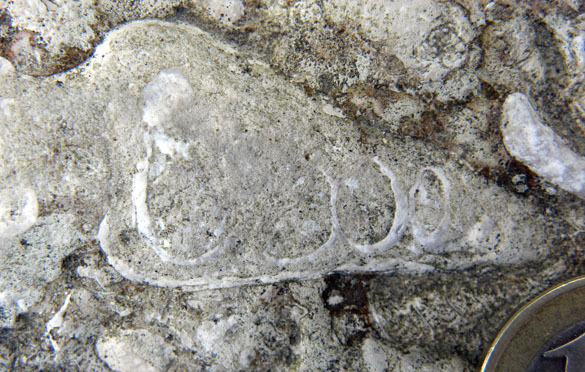 We saw that many are formed around gastropod (snail) shells — very much like a Jurassic version I recently described as one of Wooster’s Fossils of the Week. Tonight we will celebrate the 4th of July with a pizza dinner in downtown Kuressaare. It is as close to American food as we can get here. 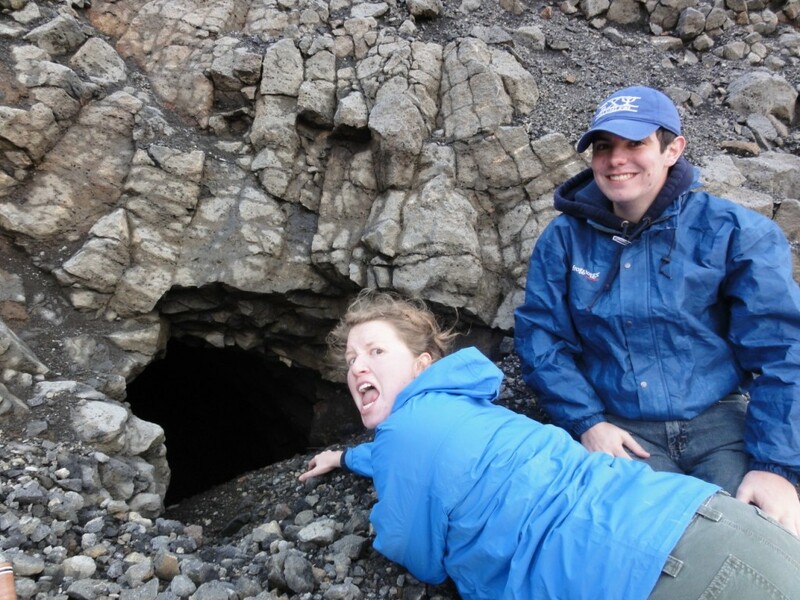 On this holiday we salute the Wooster Geologists Iceland Team also far from home on the front lines of science! 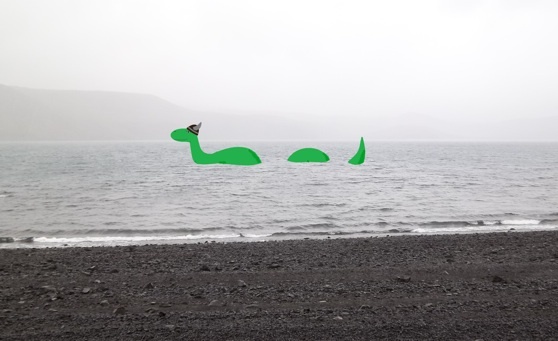 We only spent about 2 hours in Undirhlíðar yesterday due to the gale force winds that sent basalt shrapnel flying into our faces, in particular our eyeballs. It wasn’t raining luckily, as raindrops probably would have been lethal at that wind speed. We made an awesome discovery though on the Northeast wall- A lava tube! We were climbing up a talus pile when we noticed the hole leading down into the wall. Travis is either falling in or being dragged in by a troll. Travis may be convinced not to go into the lava tube but Lindsey still clings to the idea. 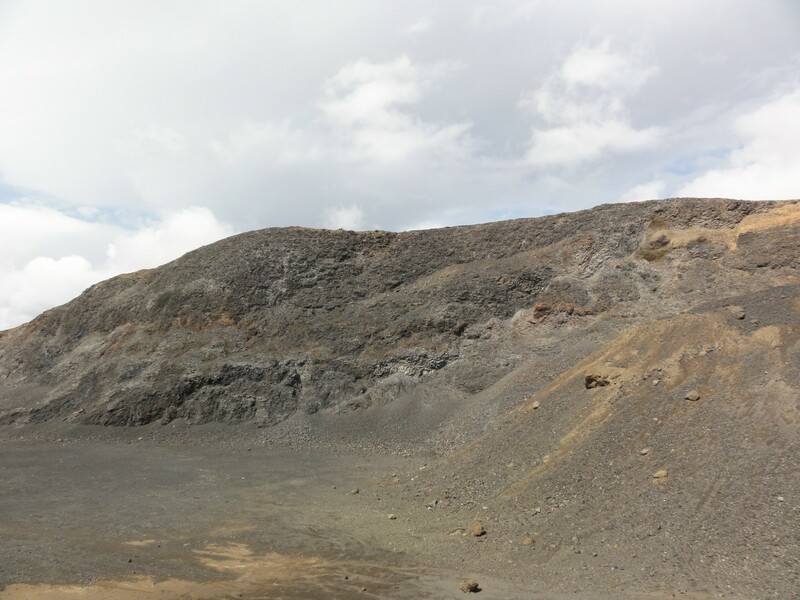 We then moved on to the West wall and found basalt that looked drastically different than anything we had found in the East wall. The West Wall, Undirlihdar Quarry. 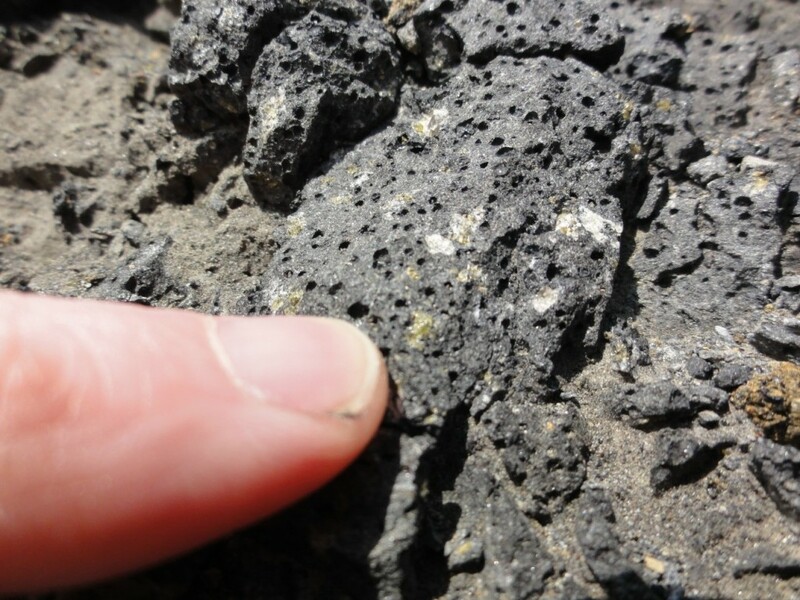 Sizable olivine and plagioclase crystals were in all of the rock units we saw in the Southern end of the West wall. Large olivine phenocrysts within the basalts of the west wall! 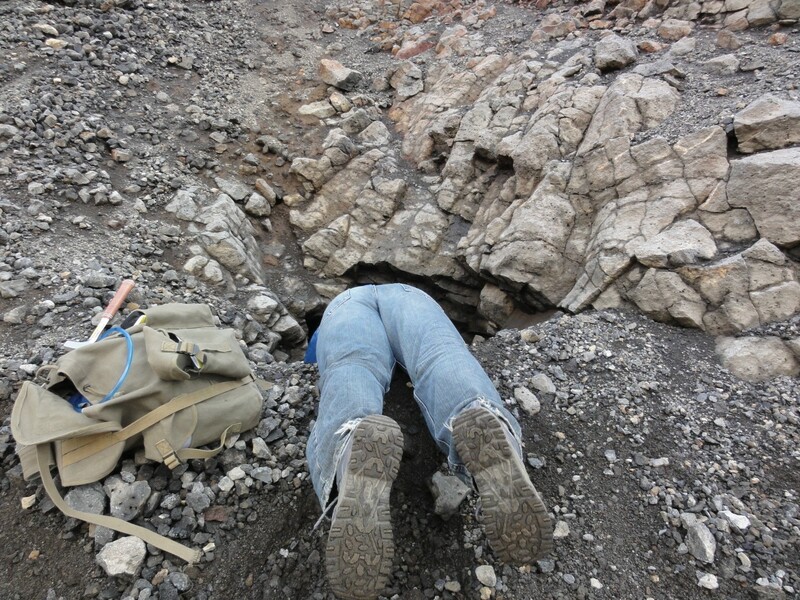 Today is our last day of field work in the quarries, we’ll keep you updated on our continued adventures.